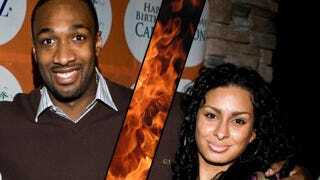 In the wake of getting served with child-support papers at halftime of a Magic/Wizards game, Gilbert Arenas is rather perturbed about his baby mama Laura Govan's approach to public shaming. So says a source in the D.C. media, who was kind enough to share straight-from-the-mouth-of-Arenas thoughts on Govan — sister of "Basketball Wife" Gloria Govan — with us. On Nov. 20, Laura kicked Gilbert out of the house because Gilbert did not adequately ask how her day went. This was taken to mean he was more concerned about work than family. Her: I'll go to police if you don't do as I say. This was a tricky proposition considering the ongoing probation from the gun (in the locker room) charge. She allegedly said, "If you try and pick up the kids at school, I will tell them you weren't authorized to do so and that's going to be a violation of your probation." After a road trip, he moved in with Wizards teammate Nick Young, but says he stayed in constant contact with one of Laura's younger brothers (who, as it happens, Laura also kicked out the house). When he learned he'd been traded, he let little bro know. Even though he wanted to see the kids, there was no reason to say goodbye to baby mama. Baby mama stayed in touch with him indirectly, though. As in, she called Magic GM Otis Smith and told him, "If he doesn't abide by my demands, I will ruin this new start for him." Demands to the tune of $1.3 million a year, the kind of stuff financial advisor Lester Knispel wasn't having. Says Gilbert, "Well, I don't want to get into all the he-said, she-said stuff. Whoever the source is, they're pretty accurate on the things they are saying. ... You have enough money to get a publicist, but there's no money for the kids to eat? She's watching too much Basketball Wives." • The notion that Ms. Govan's been financially frozen out. "She's like that bum on the street asking for money, but if you follow that bum home, you discover he's got five cars and a mansion. She gets 20 grand a month. She got $8,000 allowance. We both did. ... You're pretending your living a bad life, but the facts really are: you get 20 grand a month and you live in a three-bedroom townhouse in San Ramon, Calif."
• The fact that his sharks — of the $5,000 monthly care fee — are no longer of this world. "One thing I can comment on is the sharks. My sharks are dead. Yes, somehow, pennies ended up in the tank. I was told the copper distresses them. I'm not going to say it was her, I'm just saying they didn't make it." • On being painted as a deadbeat dad. "All I hear is, ‘I left the kids.' She won't let the kids see me. All I hear is, ‘Gilbert took everything.' Sure I did. She took a SL600. She took the Range Rover, which I don't mind because she has to drive the kids around. Oh, all my furniture and all my clothes, about $4 million worth of stuff? Gone. And she says she's living in some cheap hotel? Now, I don't know how all of that is going to fit into the LA Quinta Inn — unless you bought the damn hotel." "Sure, I'm a deadbeat daddy. I get it. I'm the best daddy in the world until I didn't want to be with you. And then I'm a deadbeat daddy. I think she did this the last time we broke up." "Look, you have your lawyer. I have my lawyer. Let's do it that way." In the issue of fairness, here's a link to S2S Magazine's "Laura Govan breaks her silence" article from November. Her publicist has now taken to emailing press releases about the whole mess, too.